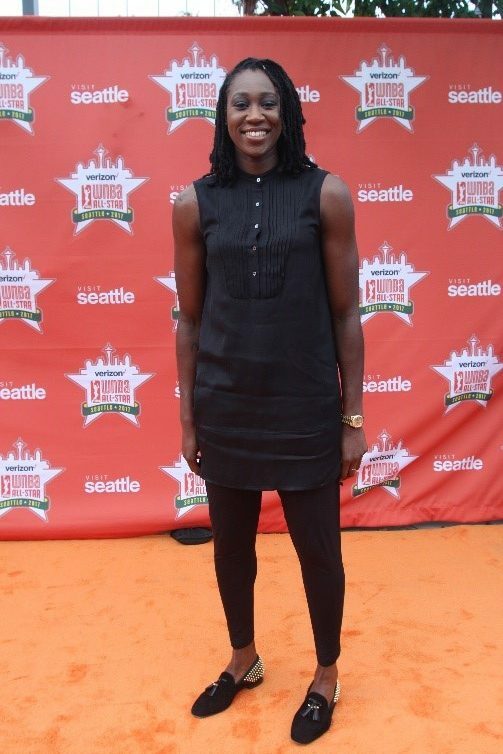 Before they faced off in the 2017 WNBA All-Star Game at KeyArena in Seattle, the players ditched the uniforms for their own personal style as they walked the orange carpet before a welcome reception in their honor. The reception was hosted by Visit Seattle and held at the Chihuly Garden and Glasshouse that sits in the shadow the Space Needle. 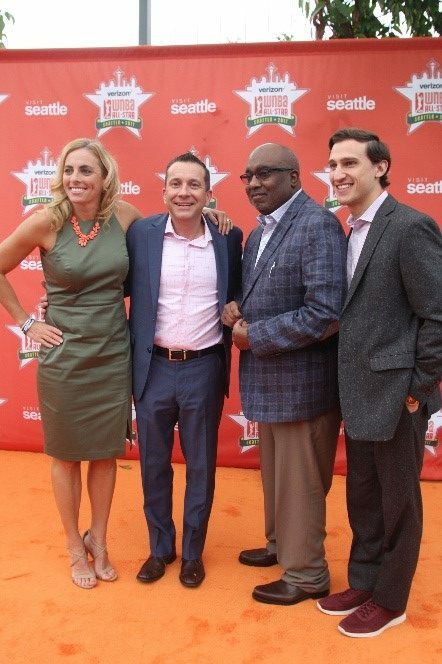 Connecticut Sun head coach Curt Miller (second from left) who coached the Eastern Conference in his first All-Star Game looks sharp as he shares the spotlight with his coaching staff. 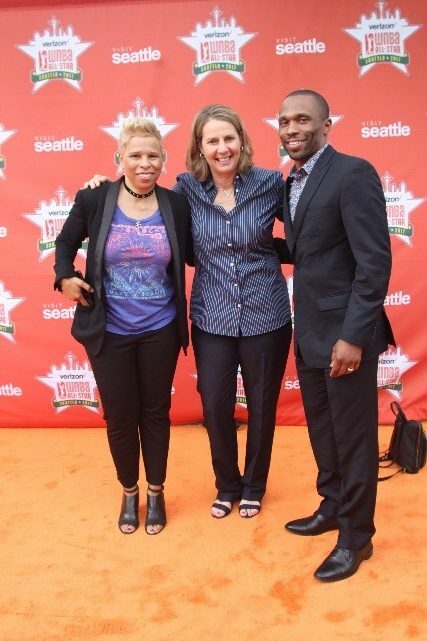 Minnesota Lynx head coach Cheryl Reeve (middle) is accompanied by her coaching staff as they enjoy the evening before coaching the Western Conference at the All-Star Game. 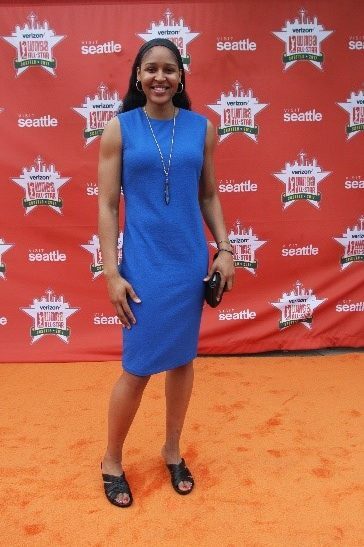 The Indiana Fever’s Candice Dupree is all smiles on the orange carpet as she prepares to play in her sixth All-Star Game. 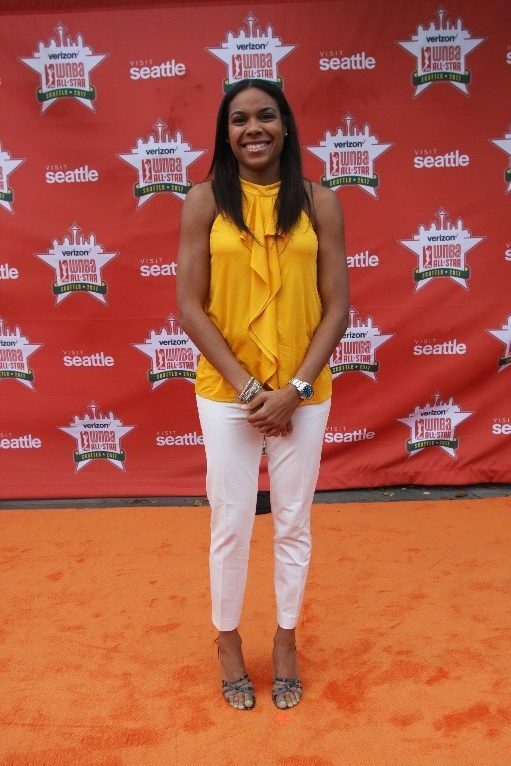 It will be her first in the Eastern Conference which makes her the first player to be an All-Star in both conferences. 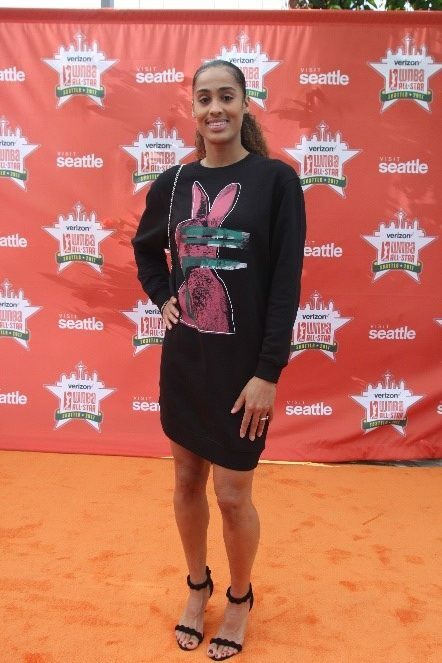 Skylar Diggins shows off her fashion sense with a unique design. 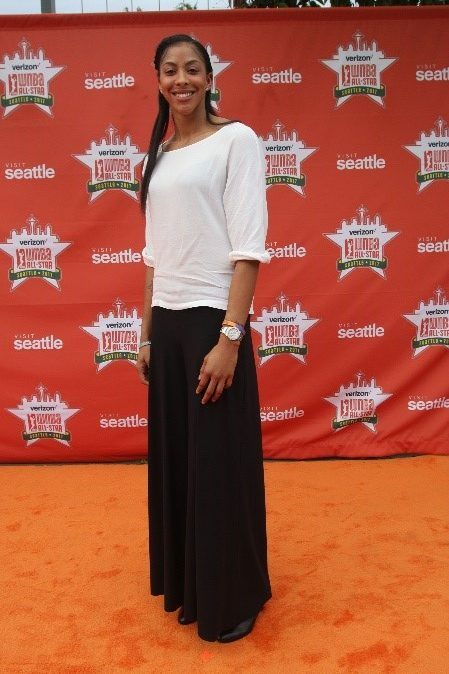 She’ll be playing in her third All-Star Game. 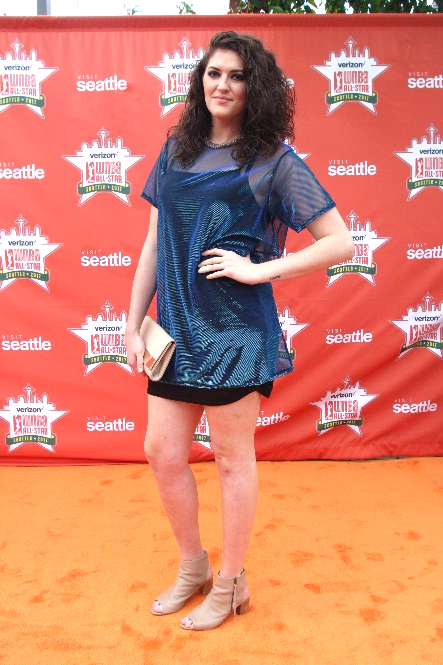 The Chicago Sky’s Stefanie Dolson knows how to present her look as she enjoys the orange carpet experience. Dolson will be participating in her second All-Star Game of her three-year career. Dolson’s teammate, Allie Quigley, a former Seattle Storm player, makes her All-Star debut. Quigley went on to win the Three-Point Contest at halftime of the 2017 All-Star Game. 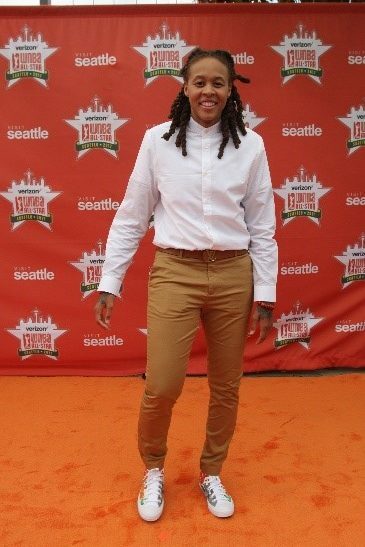 It feels like a Dream as Atlanta All-Stars Elizabeth Williams, Layshia Clarendon and Tiffany Hayes enjoy the fun of the orange carpet. All three are in their first All-Star contest. Minnesota Lynx fans in the house! 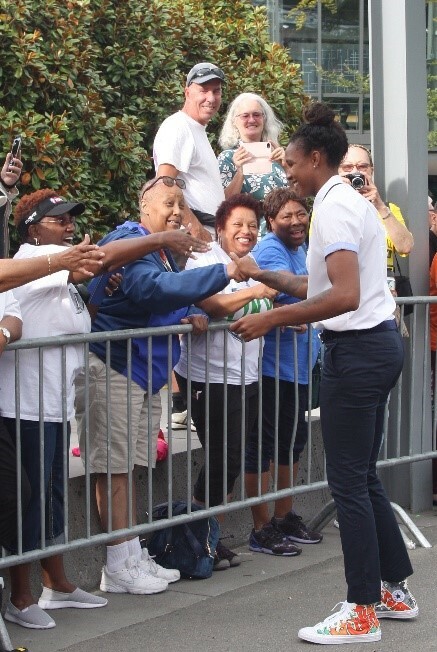 Lynx All-Stars Rebekkah Brunson and Seimone Augustus and Sylvia Fowles say hello to their fans who cheered them on as they entered the orange carpet. 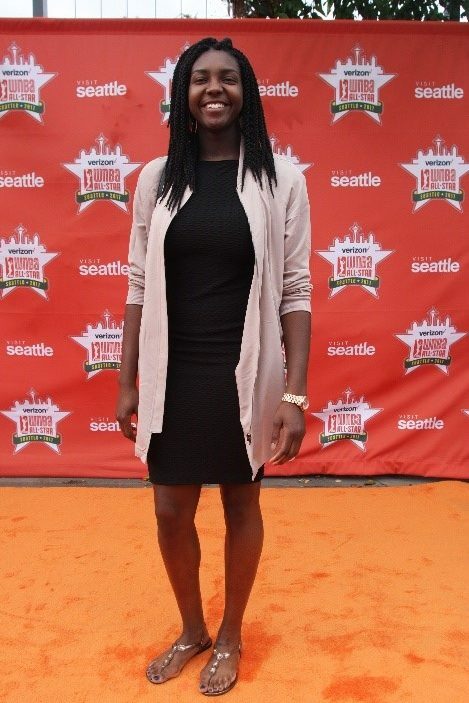 Brunson is in her fourth All-Star Game, Augustus her seventh and Fowles her fourth, this one as a starter. 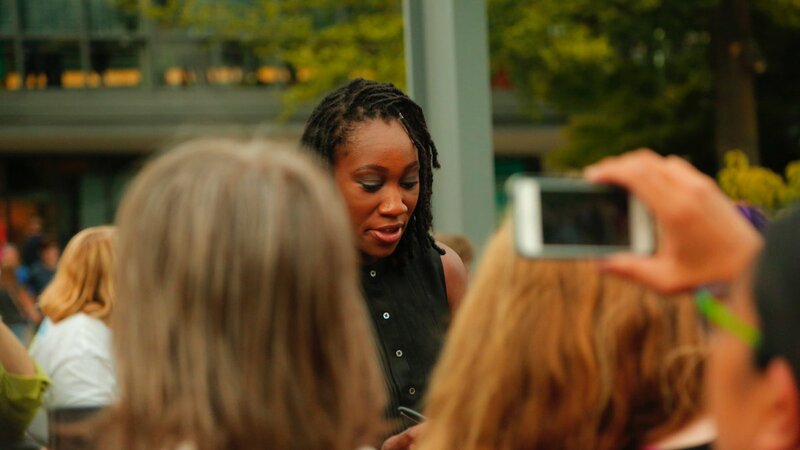 Minnesota Lynx All-Stars: Seimone Augustus, Sylvia Fowles, Maya Moore and Rebekkah Brunson. 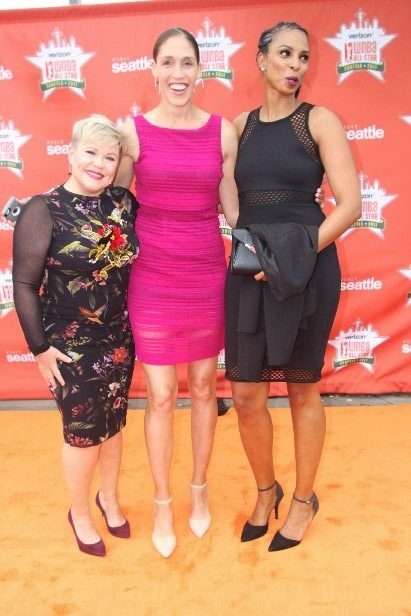 ESPN talent Holly Rowe (left), Rebecca Lobo (center) and LaChina Robinson enjoy some time off. 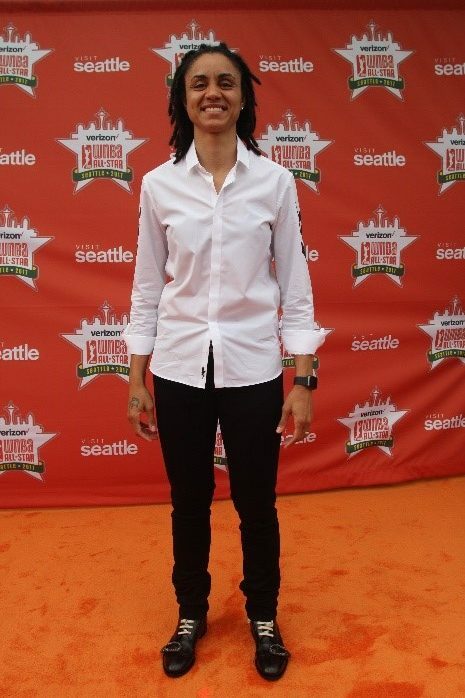 Former WNBA guard Ticha Penicheiro joins Seattle Storm head coach Jenny Boucek. Penicheiro holds the WNBA All-Time assists record (2,599) being chased down by Storm guard Sue Bird who is 69 dimes away. 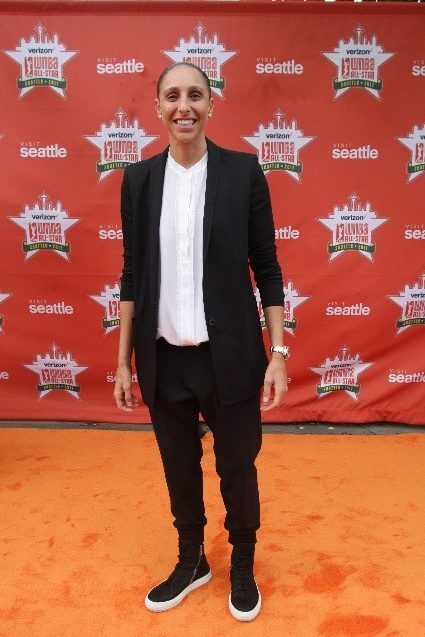 Phoenix Mercury’s Diana Taurasi attends the Welcome Reception with wife Penny Taylor. 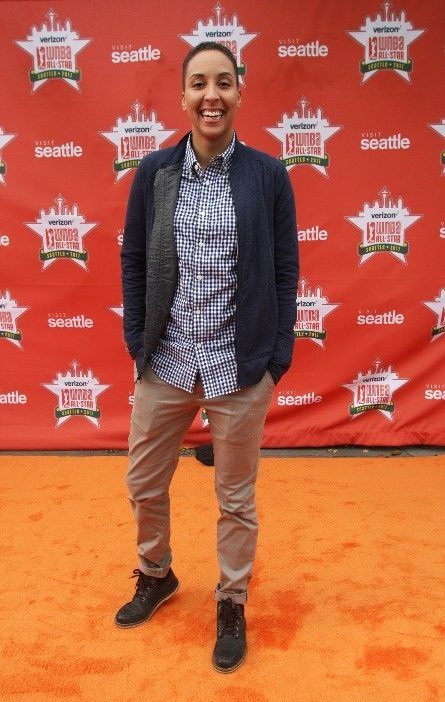 Taurasi became the WNBA All-Time points leader a few weeks ago and is making her eighth appearance at the All-Star Game. She was voted in as a starter. Taylor retired from play after last season and recently had her number 13 jersey retired as well. 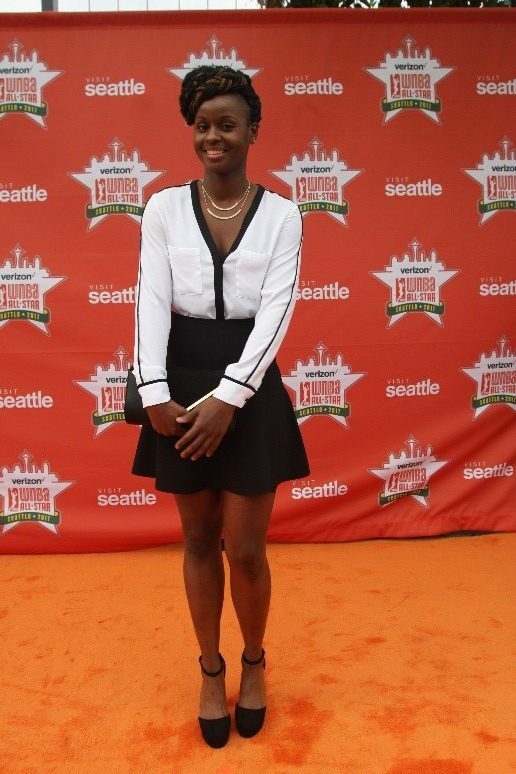 Connecticut Sun All-Star Jonquel Jones does a smooth stop on the orange carpet. 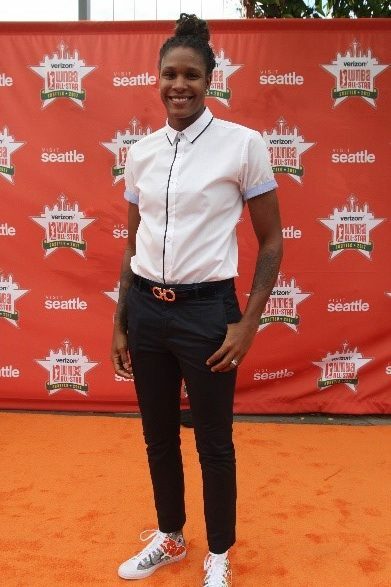 Jones will be playing in her first All-Star Game. 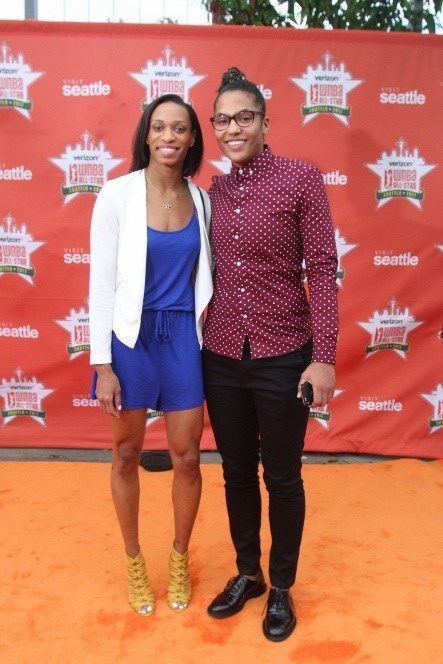 Jones’s teammates Jasmine Thomas (left) and Alyssa Thomas will also be making their All-Star debut. They are part of the eight first-time All-Stars on the Eastern Conference team. 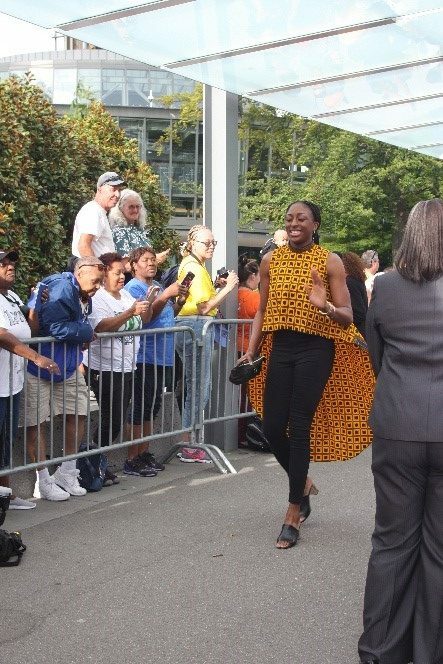 In a New York minute Liberty teammates Sugar Rodgers and Tina Charles were ready for the orange carpet.Rodgers, a four-year member of the WNBA is playing in her first All-Star Game. 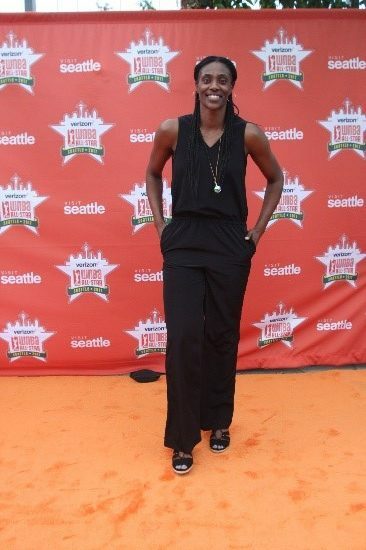 Charles makes her fifth game and was voted in as a starter. 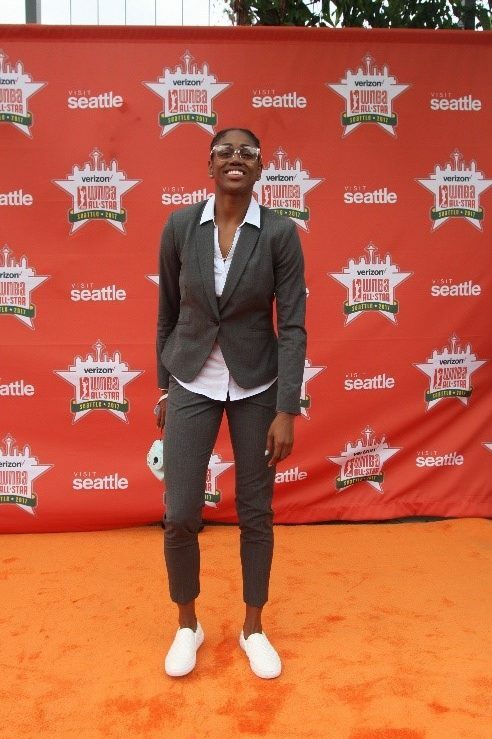 She is one of seven former UConn Huskies playing in this year’s game, the most representing from one school. 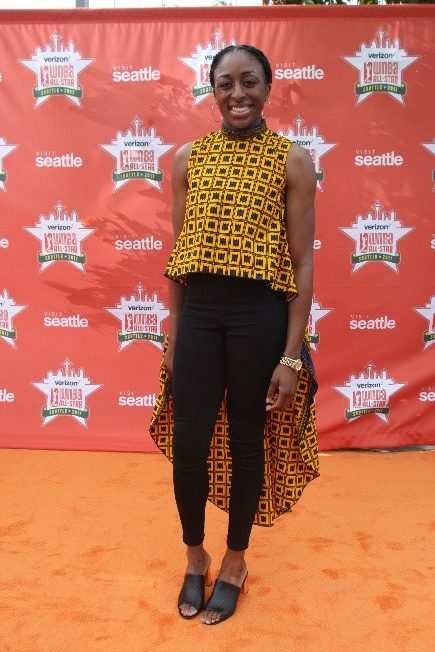 Former WNBA player Lindsey Harding joins the festivities as Los Angeles Sparks All-Star Nneka Ogwumike shows her Hollywood fashion sense as she flows past the fans on her way to the orange carpet. 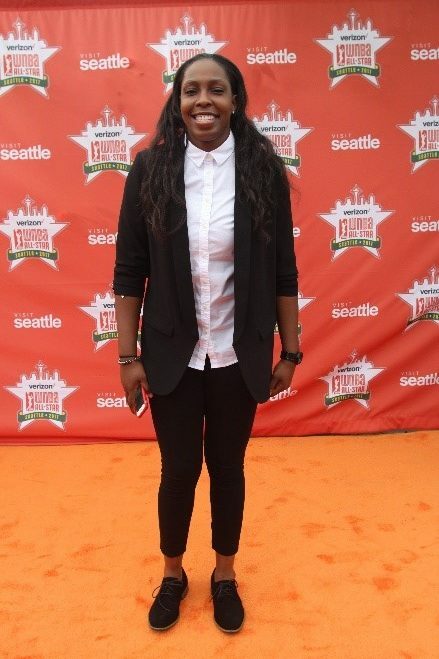 LA Sparks trio Chelsea Gray, Candace Parker and Ogwumike are all smiles as they arrive on the orange carpet. 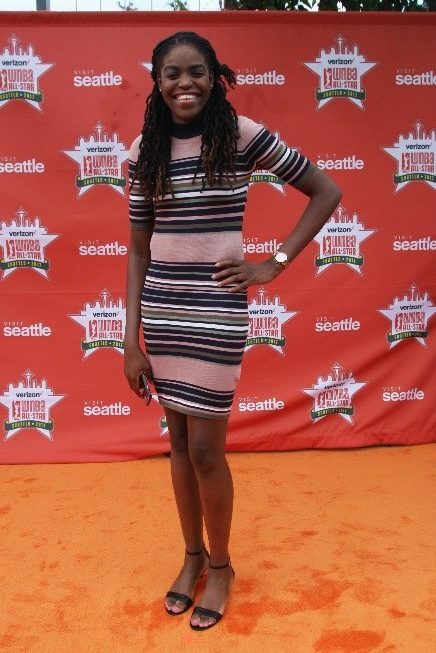 Gray is in her first All-Star Game while Ogwumike and Parker are playing in their fourth. Parker was voted in as a starter. 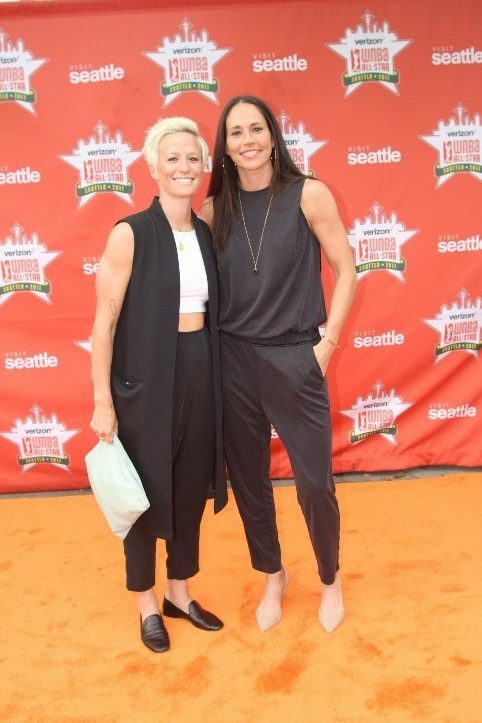 Seattle Storm represents as first-year All-Star Breanna Stewart makes her orange carpet appearance while Sue Bird makes debuts with girlfriend Megan Rapinoe of the USWNT and Seattle Reign FC. 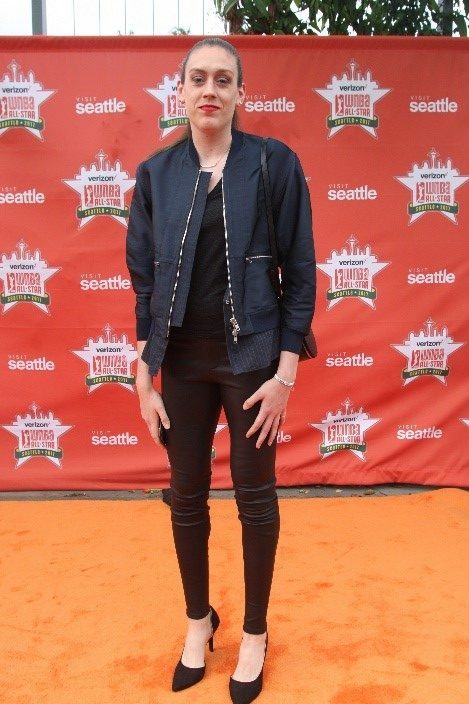 Bird was voted into her 10th All-Star Game and will be a starter for the fourth time. 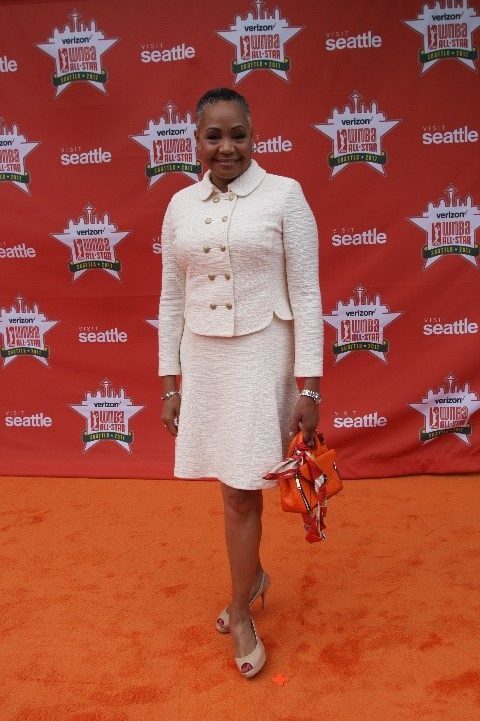 WNBA President Lisa Borders has consistently impeccable fashion taste and continues to shine as she stops on the orange carpet on her way to the Welcome Reception.